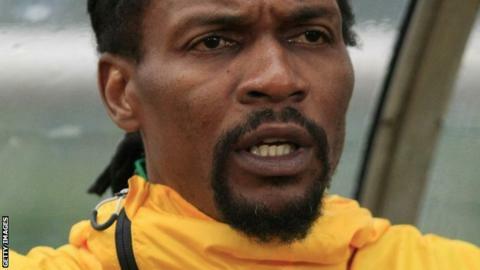 Chad have named former Cameroon captain Rigobert Song as their new national team coach. The 39-year-old was appointed on Monday to succeed Frenchman Emmanuel Tregoat, whose contract expired on 30 September. "It's not going to be an easy task to qualify for the 2017 Nations Cup but we are prepared to give our best," said the ex-Liverpool and West Ham defender. Song's first task is a 2018 World Cup qualifier against Egypt in November. Les Sao will host the Pharaohs in the first match of the two-legged tie in N'Djamena on the 14th of the month. Tregoat was told in early September, after a 5-1 defeat by Egypt, that his contract would not be renewed and Modou Kouta was placed in temporary charge of the team for the CHAN qualifier against Gabon, which they lost 2-1 on aggregate. Chad have now put their faith in Song, despite his lack of managerial experience. During his playing career, Song won over 100 caps for the Indomitable Lions, and also became the first African to play at four World Cups. Having made his international debut against Mexico in 1993, the former Galatasaray defender captained Cameroon for 10 years until Eto'o took on the role in late 2009. In 2003 he witnessed the death of Marc-Vivien Foe, who died on the pitch during Cameroon's Confederations Cup match against Colombia. Song retired from international football in 2010 after playing at the World Cup in South Africa - the only time the tournament has been held on the continent. Highlights of his club career include a four-year spell at Turkish side Galatasaray and three years in England playing for Liverpool and West Ham between 1999 and 2002.